Clarendon Park locals Helen and Geoff tied the knot at the end of May this year, and they kept the planning of their big day very close to home. From getting the house ready for an overseas family visit, to essentials like their wedding cake, the couple went out of their way to keep things local. If you’re engaged and planning your own Leicestershire wedding, this article is packed full of tips and ideas on all that Leicester’s Clarendon Park has to offer brides and grooms to-be. From wedding and engagement rings to unconventional floristry ideas, there’s plenty here to get you thinking. For the rest of us, there’s something inspiring about Helen and Geoff’s story – it demonstrates the benefits of supporting local independent businesses and involving others from across the community in both our everyday lives and our great events. Helen says: Trying to keep things simple, I had decided not to have a bouquet and was only going to have our flower girl, Geoff’s niece, carry a pinwheel. While looking around for something suitable, I happened to walk past All About Daisy on Montague Road just a week before the wedding. Having just made some paper flowers for a family wedding, Michelle happened to have a bucketful outside, some plain coloured and others made out of recycled newspapers. The blue one seemed perfect for our flower girl but, the longer we looked at them, the more I thought they might be great for the bridesmaids and myself too! My parents were with me and my dad loved the paper flowers so much, he asked if Michelle could make smaller ones for the dads’ buttonholes to match my flower. She was so accommodating – they were ready within two days and looked wonderful! Paper flowers: a quirky way to add a floral element to your wedding day – and they last forever! All About Daisy’s Michelle Harvey says: All About Daisy had only just opened when Helen and Geoff called in. They had seen the paper flower display outside the shop and asked if we could make some for their upcoming wedding. Of course we could; we were delighted to be able to contribute to their big day. 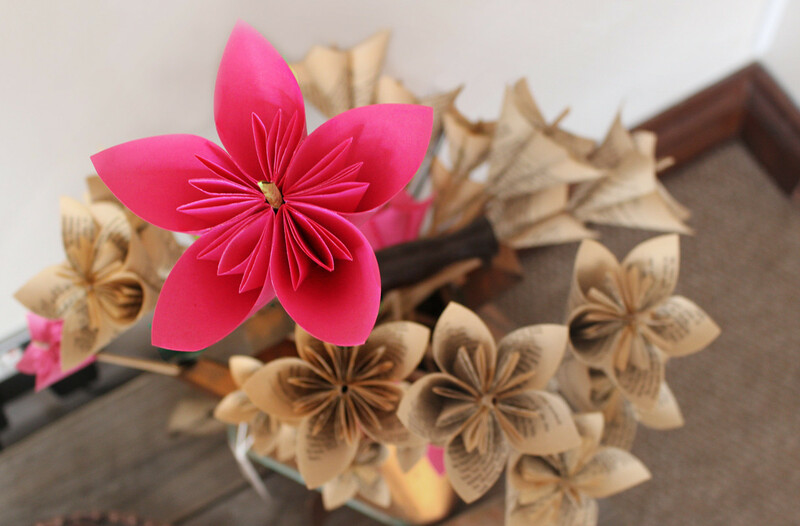 Recycling is our thing and paper flowers are a great way to give scrap paper a new lease of life. We are always happy to make them to order and can usually accommodate size and colour choice. We also make jewellery from junk mail and stock many fair trade items made from recycled paper. We wish Helen and Geoff every future happiness and hope that in a years time, on their paper (first) wedding anniversary, they and their family will be back for some very appropriate gifts. Helen says: I’d lost weight in the run up to the wedding and by the time it got close to the day itself my engagement ring was so loose I had to wear it on my middle finger! I’d visited a couple of jewellers in town and they’d said they wouldn’t be able to alter it because the design was too intricate. I had resigned myself to wearing it on the ‘wrong’ finger forever but thankfully I popped into Michael Grundy Jewellers on Queens Road and Michael said he’d be able to adjust it. Two weeks later I had the ring back – it fit perfectly and you couldn’t even see it had been repaired. 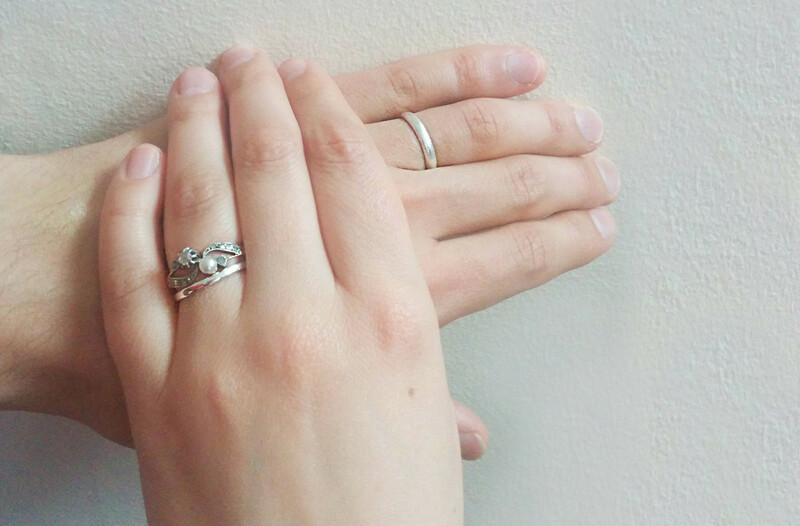 We also both had to get our wedding rings resized just before the wedding (again, due to the weight loss!) and Michael took care of that too. Michael Grundy says: Many people need to have their engagement or wedding rings altered at some point in their marriage. With very intricate rings it can certainly be more of a challenge, but I specialise in this kind of detailed work and have for the last 40 years. As well as repairs and alterations we design and hand make a great range of gold and silver wedding and engagement rings. Geoff says: My parents live in Canada and visited us in Leicester for the first time just before the wedding. We were keen to make sure our house was in tip-top shape. We didn’t have time to do it ourselves with all the wedding preparations and so looked on the Clarendon Park Facebook Community page for advice. Julia Adamson, who runs her own local cleaning business, had been recommended by others so we got in touch and she did a fantastic job! Julia Adamson says: It was a pleasure helping Helen and Geoff, providing exactly what my business is – An Extra Pair of Hands! I do one-off cleans for ‘mother-in-law visits’ and special occasions, or when the house just needs a good blitz! I also offer organising and de-cluttering help. Contact me via Facebook. Geoff says: Brunch is a big deal in Canada, so what better way to try out the latest culinary addition to Queens Road than by bringing a bunch of Canadians to try out the brunch menu?! The food at Cultura was great – Helen is vegetarian and they had some good options for her – and the surroundings are really lovely. We’ll definitely be back! Helen says: I first heard about The Hair Room on Montague Road through the Clarendon Park voucher booklet which came through my door earlier this year. There was a special offer to get a discount if you booked both hair and nail appointments. Elle did a great job with my hair which can be quite thin and uninteresting, but she gave it some body! I also got a French manicure from Debbie which was amazingly resilient – I never normally grow my nails so it was a real treat to have them looking so great at a time when there was much more focus on my hands than usual! Katy Bhoe from The Hair Room, says: We think it’s great that Helen and Geoff have supported so many local businesses for their wedding day needs. At The Hair Room, we offer bridal packages which can include hair, makeup and nail services. As well as pampering you in the salon, we can come out to your venue or your home on the day. 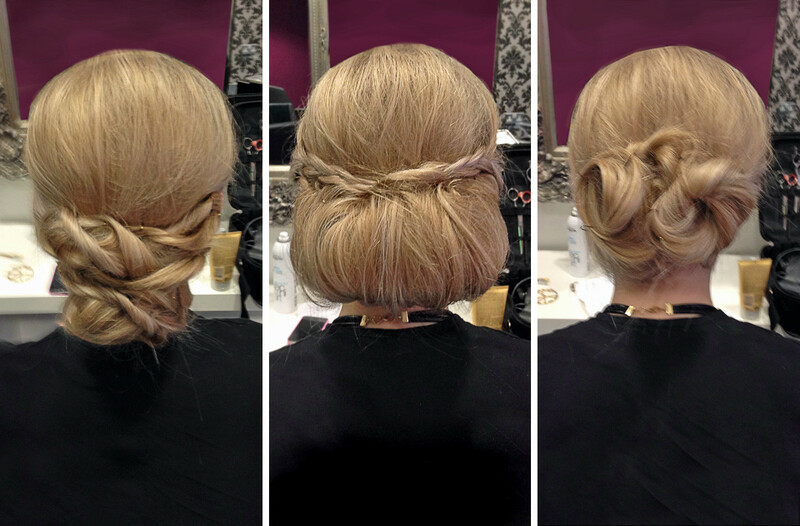 It was lovely to have met Helen – we’re happy she loved our services and hope to see her again soon at The Hair Room. Congratulations both on the wedding! Geoff says: Gents and Boys Hairdressers on Clarendon Park Road is my go-to barber in Clarendon Park. They always have appointments available and provide a friendly service at a great price! Helen says: My mum is a great believer in massages and so gave me a voucher for The Snug on Clarendon Park Road for my birthday, which was a few weeks before the wedding. I spend most of my working life sat behind a desk so the ‘Back Indulgence’ massage was ideal. 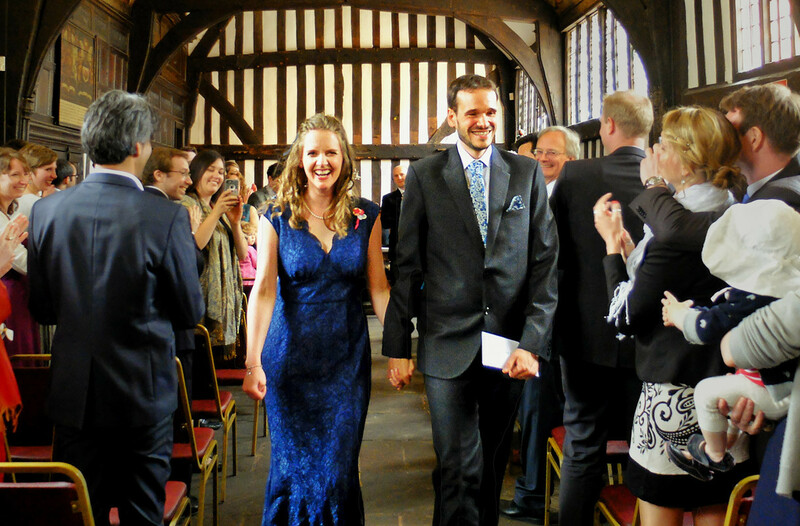 I enjoyed it so much that I immediately booked a follow-up for three days before the wedding – it was the perfect way to unwind in between sorting out the last-minute details. 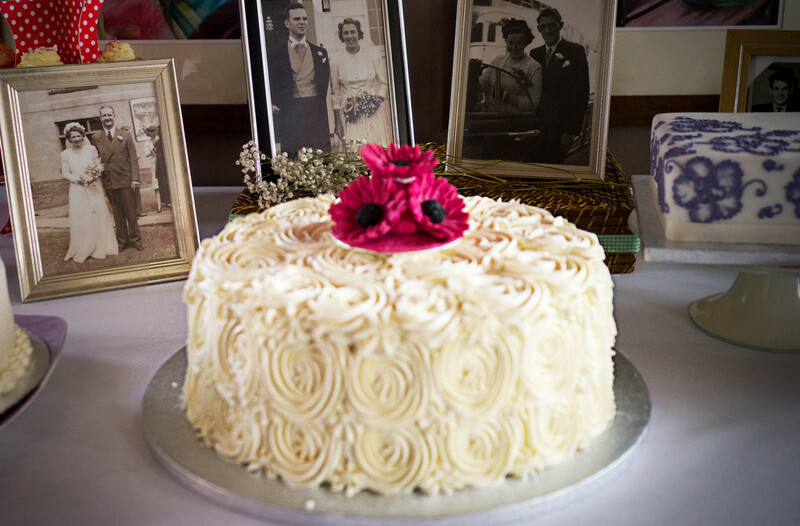 Helen says: Choosing the cake was possibly the nicest part of wedding planning! All we had when we met with Lindsay at The Tiny Bakery on Clarendon Park Road was a few photos from a quick Google search. After about ten minutes of chatting to us about what the wedding was going to be like, she had come up with a great design with roses piped on the outside and fondant gerberas on top, which matched the flowers at the reception. It made a fantastic centrepiece for our sweets table. We’re very grateful – both for the cake and for all the coffees and tasty treats the rest of the time! The Tiny Bakery’s Alwyn Morris says: Helen and Geoff are regular customers and as a lovely local couple we were delighted that they asked us to make their wedding cake for them. They came to us with various ideas including a few pictures they’d seen on the internet. They wanted a bright and funky lemon cake with pink flowers on top. As you can see, we chose gerberas (made of icing) in a fuchsia pink which looked dramatic as well as elegant, and we used lemon buttercream icing. We do a huge range of celebration cakes for all kinds of occasions. Helen and Geoff told us many people commented on how beautiful their cake was; above all, we were most pleased that they were happy with it. Geoff says: We have been brunch regulars at Jones’ on Queens Road since we moved to the area. They have a really fantastic English breakfast which has become a staple part of our weekends. As such, it was fitting that one of our first meals out as newlyweds was there: some friends who couldn’t make the wedding took us to Jones’ for dinner to make up for it. It was our first evening meal there and definitely didn’t disappoint! No article about Clarendon Park’s wedding suppliers would be complete without mention of Noble and Wright, a wedding dress shop on Queens Road specialising in luxury and bespoke wedding dresses. This high-class atelier has a fantastic reputation and is rapidly becoming one of Leicester’s premier bridal boutiques. And if you fancy a bit of luxury without the price tag you’re in luck – on Saturday 29 August the shop is having a massive sale with up to 70% off designer brands including Pronovias, David Fielden and Temperley London. That’s got to be worth making a visit! Helen and Geoff say: We moved to Clarendon Park just over a year ago and felt immediately at home. It’s such a wonderful area of Leicester with everything you need, which means that we rarely go into town! Whether it’s eating out at Spice Bazaar, picking up random household items from Jeff Hardware and DIY or browsing the summer and winter fairs, we always find something to do here and enjoy the great range of local suppliers. We’re so glad that we got to call upon their services while planning our wedding – it made the day extra special and we never want to leave! Thank you to Helen and Geoff for sharing the story of your very local wedding with us – I’m sure everyone reading will join me in wishing you many years of love and happiness together. Has a Clarendon Park supplier been a part of one of your big events? Share your experience below and let other readers know about it! Great article, very enjoyable from an ex Clarendon Park resident perspective but where was the wedding venue? Looks great, would really like to know where it is! I don’t know Nick but I’ll find out!